Due to this, we are unable to accept grant applications at the moment. Please sign up to our newsletter for updates about the ECO scheme and check back to our site again later for further news. Why are the UK government trying to replace old, inefficient boilers? It’s likely that you will have heard terms like ‘global warming’ or ‘climate change’ before. In simple terms, they are referring to the fact that our planet’s atmosphere is getting warmer as a result of our modern lifestyles. Human activities like burning fossil fuels (gas and oil), over farming livestock, driving motor vehicles, producing industrial waste and destroying forests are increasing the level of ‘greenhouse gases’ in the atmosphere. These greenhouse gases form a kind of barrier around the planet and stop heat from escaping, which then makes our planet warmer. Over time this will (and already has) lead to melting ice, rising sea levels and hotter temperatures which lead to wildfires, drought and tropical storms. So what are the government doing to help? Many countries around the world are stepping up and taking responsibility for their greenhouse gas emissions, and the UK is no exception. The Climate Change Act in 2008 outlined the government’s plan to reduce our emissions and do our bit to protect the planet. The main aim of the Climate Change Act is to reduce our greenhouse emissions and we have a target. In 2050, we will emit 80% less emissions than we produced in 1990. It’s an ambitious target so they have only outlined a plan up until 2032 so far, which has been divided into 5 periods, each with its own target. We are currently in the 2nd period (2013-2017) and the third will begin in 2018. What has this got to do with your boiler? When we heat our homes with gas, oil or electric boilers we are contributing more carbon dioxide to the problem. If we are using old, inefficient boilers that need to burn a lot of fuel to run, this contribution is even bigger. Over the years boiler technology has moved on considerably and modern boilers have a much better level of energy efficiency and produce less greenhouse gases. The government want to replace old boilers (over 8 years old) with more efficient models or, even better, with ‘carbon neutral’ biomass boilers that don’t add any greenhouse gas to the atmosphere. But new boilers are expensive, and the government can’t get people to spend money they simply haven’t got. They can, however, get the energy companies to help, which is exactly what they’ve done via the Energy Company Obligation Scheme. ECO came about in 2013 replacing a previous but similar version known as the Warmfront Scheme. The government’s ECO scheme legally obliges the biggest energy companies in the UK to help some people to improve the energy efficiency of their homes. Low income households who wouldn’t otherwise be able to improve the efficiency of their home can get help to replace their boiler and / or home insulation. 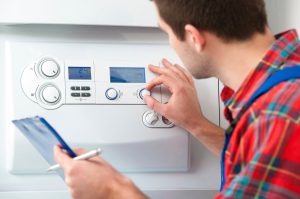 A new boiler could significantly lower your carbon emissions and reduce your energy bills. Home Heating Cost Reduction Obligation (HHCRO) or the Affordable Warmth scheme enables people on certain benefits (including both homeowners and private renters) to make heating their home more affordable. This could be via a new heating system and/or better loft or cavity insulation. Carbon Emissions Reduction Obligation (CERO) targets those in homes that are hard to heat such as solid wall properties including social housing, privately rented and owned homes. Carbon Savings Communities Obligation (CSCO) focuses on certain postcodes that need energy efficiency improvements the most; this includes solid wall, cavity wall and loft insulation. Each of the biggest energy providers have been given a target to meet i.e. the number of households from each strand that they need to help to improve their energy efficiency. They’ve all set aside a budget to fund some or all of the cost to install new heating or insulation in the UK homes that meet the criteria. 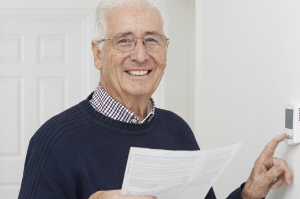 They don’t pay you any money but will deal directly with the installer providing the service, meaning that the installer gets paid as usual and you get a cheaper (or even free) new boiler. If you meet the qualifying criteria and are on certain benefits you can apply for a government boiler grant. Check if you’re eligible for a grant. The next step is to start your application by entering your postcode here on the Boiler Grants website. We’ll then ask a few more qualifying questions and, if you’re eligible, we will be in touch very soon afterwards to talk you through the rest of the process. 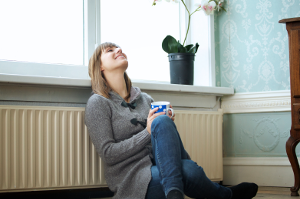 You could be warm and cosy with a brand new, government funded boiler sooner than you think. The ECO scheme (in its current form) will run until September 2018.